Curious George Goes Fishing is a fun book filled with both adorable illustrations and lengthy text. My wife enjoyed reading it to our baby. When reading children’s books to babies, it is actually easier to read books with lots of words than it is to read books with no words. If a book has few words, adults have to make up the story to hold children’s attention. Books with an actual story allow readers to simply read the text. 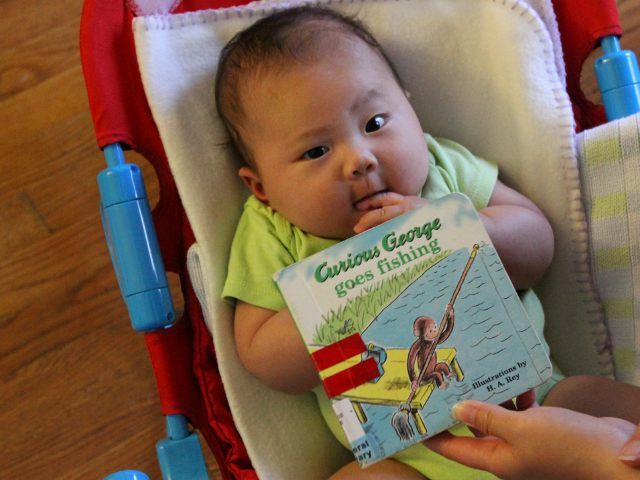 After a series of books where Mommy and Daddy had to think of what to say on each page, Curious George Goes Fishing was a needed break. In the book George spots a man holding a long stick with a long string walking to the lake. George follows the man to the water and watches him fish. Then George tries, in his own special way, to go fishing as well. Rey’s drawings are colorful enough to hold the attention of young babies while the amusing story is interesting even to adults. Arya really liked the page with all the fish swimming towards George’s homemade lure. I like the fact that the text uses varied sentence structure despite relying on simply words. Although they have both passed away, the Houghton Mifflin Company controls the rights to the franchise and released Curious George Goes Fishing in 2001. Curious George Goes Fishing costs (including shipping) $5.95 new and $3.44 used from Amazon.